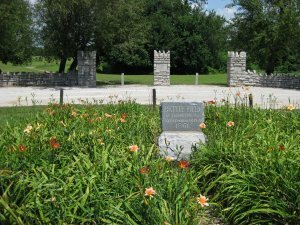 Directions: The entrance to the battlefield is located near the corner of 15th and Wood Streets in Lexington Missouri 64067. There is limited parking at the entrance to the battlefield. 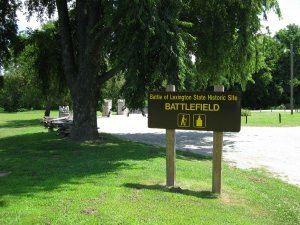 You can also park at the Visitor Center parking lot for the Battle of Lexington State Historic Site at 1101 Delaware Street, Lexington Missouri 64067. You can then walk up the hill to the east from the Anderson House. 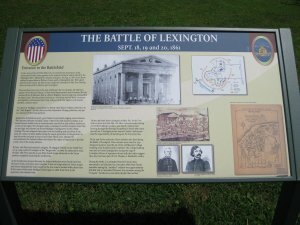 Description: A significant portion of the Federal entrenchments have been preserved at the Lexington Battlefield. 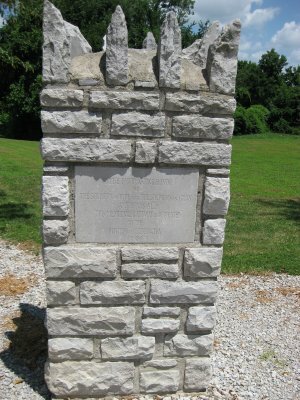 There is a marker and a Memorial Gateway dedicated to the memory of the soldiers from both sides of the conflict. Take a moment to read the "Entrance to the Battlefield" interpretive sign [ Waypoint = N39 11.459 W93 52.675 ].